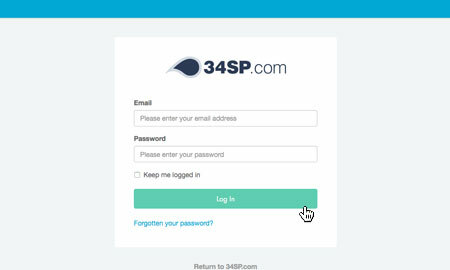 This is a quick step-by-step guide to viewing, editing, adding and removing MySQL databases & database users via the 34SP.com Control Panel. After you have clicked on the website you wish to edit, you will be presented with your website overview page. Choose 'Databases' from the product navigation. The 'Manage Databases' page provides an overview of your databases, with each database listed in a table. 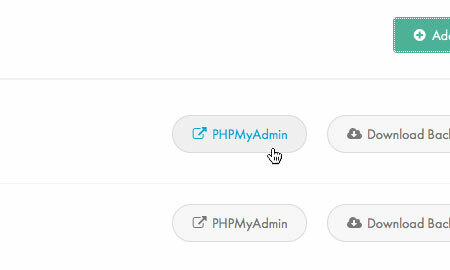 Along with viewing each database name, you can access 'phpMyAdmin' and remove databases via the table, by clicking on the relevant icon. Please note: phpMyAdmin is a third party web interface for editing and managed your databases. 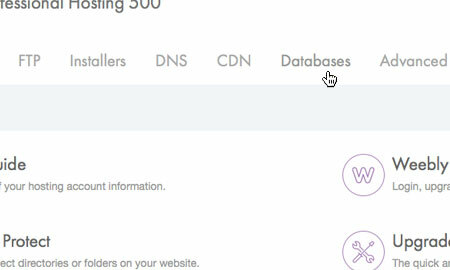 If you wish to add a new database, simply click on the button labelled 'Add New Database' when viewing the 'Databases' page. This will bring up a form. Simply fill in the form with the relevant information. 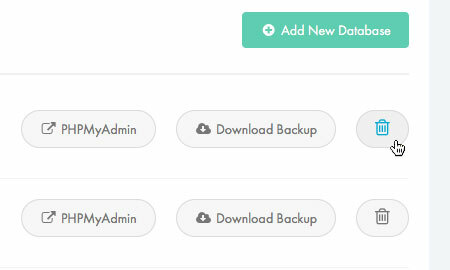 When you're done, click 'Create Database' to save your changes. Please note: Once you have clicked on 'Create Database', a new database will be added to your list of databases. A new database user will also be added to your list of database users. 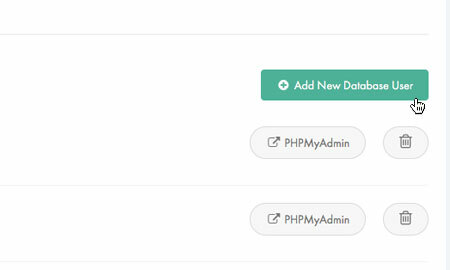 If you want to edit or clean up your database, you can do so via phpMyAdmin. 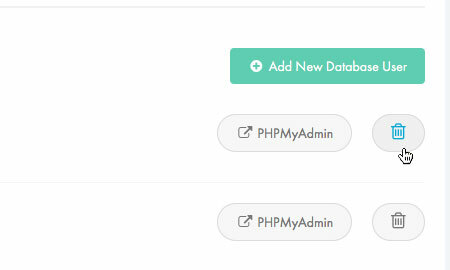 To edit a database, simply click on the 'phpMyAdmin' button (the box with an arrow icon) for the database you wish to edit, when viewing the 'Databases' page. Please note: We do not recommend editing a database via phpMyAdmin unless you have previous experience with SQL databases. 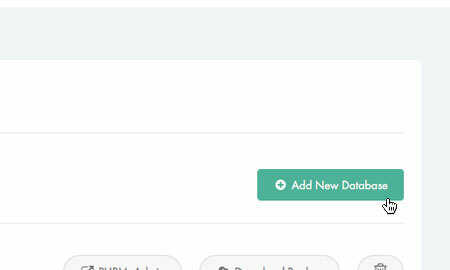 If you wish to delete a existing database simply click on the 'Remove' button (the 'trash' icon) for the database you wish to remove, when viewing the 'Databases' page. This will remove the database permanently. It will also remove the database user associated with this database. When viewing the 'Databases' page, just click on the tab labelled 'Manage Database Users'. 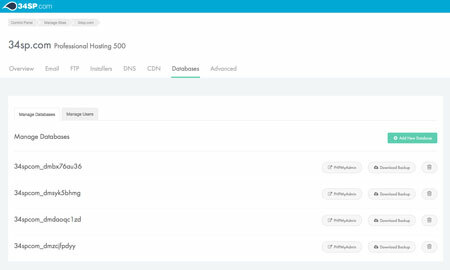 When you create a new database via the Control Panel, a new user is automatically created for that database. 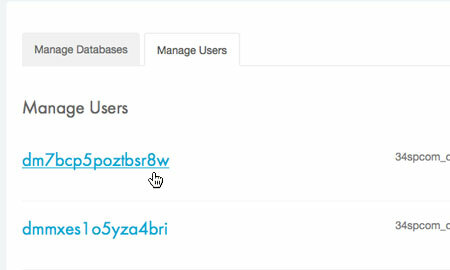 The 'Manage Database Users' page provides an overview of your database users, with each user listed in a table. 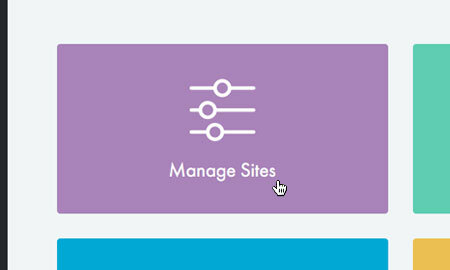 Along with viewing information on each user, you can edit, add or remove database users via the table, by clicking on the relevant icon. 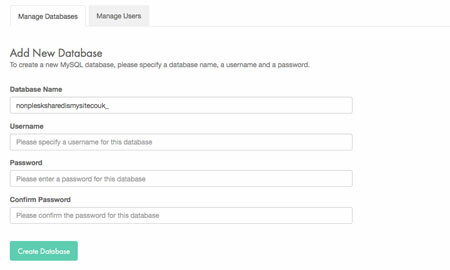 If you wish to add a new database user, simply click on the button labelled 'Add New Database User' when viewing the 'Manage Database Users' page. 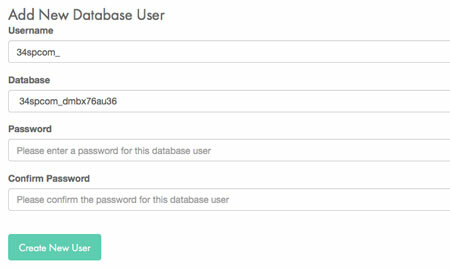 Due to security reasons, it is not possible to view a password for a database user. If you do not know the user's password, we recommend you reset it. To change or reset a database user password, simply click on the name of the user you wish to edit, when viewing the 'Manage Database Users' page. Please note: It is not possible to edit a username of an database user, or change the database they are associated with. 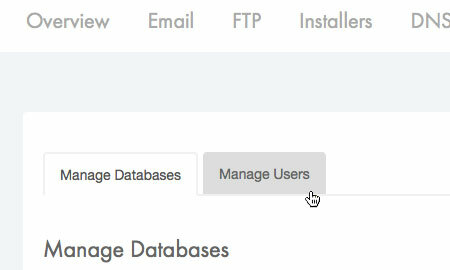 If you wish to delete a existing database user simply click on the 'Remove' button (the 'trash' icon) for the user you wish to delete, when viewing the 'Manage Database Users' page. This will remove the user permanently. Please note: Deleting a database user does not remove the associated database.